key West! 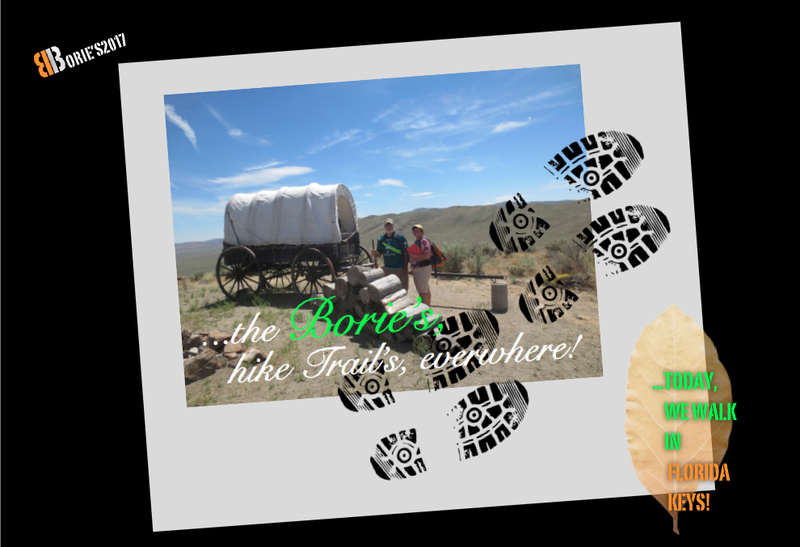 – Tony Borie – "Pieces of my life"
…if you did not see, see! …se não viste, vê! (if you did not see, see)! …já lá vão mais de trinta anos, muito perto dos quarenta, recebemos uma mensagem de Portugal, a dizer que o pai António estava doente, depressa fizemos tudo para o ir ver, sobretudo, mostrá-lo ao nosso filho Tony, pois em todas as conversas que tínhamos sobre ele, sempre falávamos dele como um “heroi”, não sabia ler ou escrever, assinava de cruz, mais tarde, desenhava o seu nome, criou a sua família, alimentando-a à base de uma agricultura artesanal, deixou os filhos irem à escola do Adro, na vila de Águeda, tinha coragem para ser do “contra”, fazia favores aos vizinhos, por vezes dava o último bocado de broa a um cigano ou qualquer pobre que por lá passava, sempre com um sorriso naquele rosto com a pele morena e enrugada, do sol ou chuva que recebia, pegando numa enxada o dia inteiro, onde aquela boina preta, que encobria um olhar de sofrimento, lhe dava um ar de pessoa honesta e amargurada, sobrevivendo numa sociedade complicada, sempre contrariado quando descia à vila de Águeda, onde alguns invejavam a sua coragem e outros o desprezavam, porque eram beneficiados pelo tal sistema e viam naquela simples personagem, uma negação às benesses com que eram contemplados. 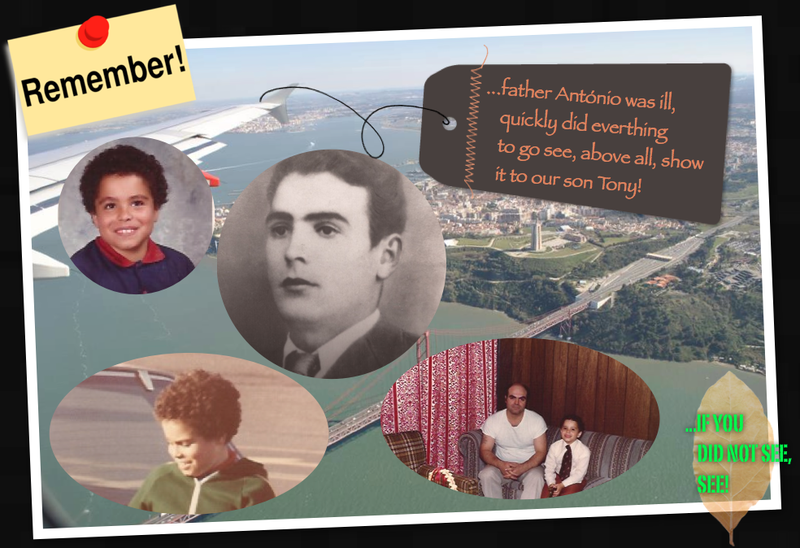 (it’s been over thirty years, very close to forty, we received a message from Portugal, to say that the father Antonio was ill, quickly did everything to go see, above all, show it to our son Tony, for in all the conversations we had about him, always spokehim as a “hero” could not read or write, signed cross later drew its name, has created his family, feeding it to the base of a handmade agriculture, left the children go to Adro school, in the village of Agueda, hadcourage to be the “against” doing favors for neighbors sometimes gave the last bit of bread to a gypsy or any poor that there passed, always with a smile on that face with brown skin and wrinkled, sun or rain received, taking a hoe all day, where that black beret, which covered a look of suffering, gave him an air of honest and embittered person, surviving in a complicated society, always thwarted when the saw down in the village of Agueda, where some envied their courage and others despised him because they were beneficiaries of such a system and saw that simple character, a denial to the blessings that were contemplated)!. – Então, estás nos Estados Unidos, de lá, no sul, existe algum local onde se pode ver a ilha de Cuba? – Tu já viste, pois se não viste, vê, é lá, naquela ilha, naquele líder que está o futuro!. – So you are in the United States, there in the south, there is some place where you can see the island of Cuba? – You have seen, for if you did not see, see, it’s there, on that island, that leader is the future)!. …nós ouvimos, lembrámo-nos de que não respondemos, pensando que aquelas palavras, vindo da boca de um amigo, que naquele momento, parecia se ter tornado num inimigo feroz, valiam o que podiam valer, no entanto muitos anos passaram, quis o destino que viéssemos viver aqui para a Flórida, portanto, talvez seguindo a recomendação do nosso amigo, que parecia ser nosso inimigo, “representante do povo” e, segundo viemos a saber, não exerceu por muito tempo a tal “representação”, pois pouco tempo depois abandonou o mandato, emigrando “a salto” para França, talvez desolado por todas as manhãs ao sair de casa ver que a sua rua continuava com o mesmo aspecto. Disse-nos mais tarde a mãe Ilda que queria exercer o tal poder, mas em seu benefício, pois das primeiras decisões que quis tomar, após a sua eleição, foi querer alargar a rua em frente à sua casa, roubando o terreno dos seus vizinhos, alargando e beneficiando a frente da sua casa, o que não conseguiu, pois o tal “seu povo”, não concordou!. Enfim, pequenas “coisas da revolução” que podem ser consideradas normais, em qualquer revolução, em qualquer país!. (we hear, we remember that do not respond, thinking that those words coming from the mouth of a friend, at that moment, seemed to have become a fierce enemy, were worth what they could be worth, though many years have passed, as fate we came to live here to Florida, so perhaps following the recommendation of our friend, who seemedbe our enemy, “representative of the people”, and second we learned, not exercised for a long time to such “representation” for a short time then he abandoned the mandate, emigrating “to jump” to France, perhaps desolate by every morning to leave house see that their street still with the same look. He told us later mother Ilda who wanted to exercise such power, but for their benefit, since the first decisions which would take after his election, has been wanting to expand the street in front of his house, stealing the land from its neighbors by extending and benefiting the front of his house, which he could not, because such “his people” did not agree!. Anyway, small “things of the revolution” that can be considered normal in any revolution in any country)!. …como dizíamos, talvez seguindo a sua “recomendação”, um dia pela madrugada, um pequeno farnel na caixa frigorífica, eis-nos na estrada rápida número 95, no sentido sul, em direcção à área das “Florida Keys”, que é um conjunto de ilhas ligadas por pontes, algumas com quilómetros de extensão, que começa na ilha de Key Largo, passando por muitas outras mais pequenas, onde as principais são as ilhas de Islamorada e de Marathon, terminando na de Key West. Levámos as canas de pesca, fomos parando aqui e ali, vendo vestígios de tempestades, em alguns locais o mar parecendo um rio, em outros, correntes fortes saindo Golfo, levando areia e ramagem em direcção ao sul, até que chegando ao nosso destino, parámos na ponta final, na ilha de Key West, onde além de muitas outras atracções existe um marco histórico identificando o local como que estando a 90 milhas, (140 Km) de Cuba, onde alguns naturais dizem que com o tempo limpo, com o auxílio de uns potentes binóculos se pode ver uma nuvem, que é a ilha de Cuba!. (as we said, perhaps following a “recommendation” one day at dawn, a small packetfood in the cold box, here in the fast road number 95, the south direction towards the area of “Florida Keys”, which is a set islands connected by bridges, some kilometers long, which begins on the island of key Largo, going through many smaller ones, where the main are the islands of Islamorada and Marathon, finishing in key West. We took the fishing rods, we were stopping here and there, seeing traces of storms in some places the sea like a river, in others, strong currents leaving Gulf, bringing sand and branches towards the south until arriving at our destination, we stopped at the tail end on the island of Key West, where in addition to many other attractions there is a landmark identifying the place as it being 90 miles (140 km) from Cuba, where some natural say with clear weather, with aid of some powerful binoculars you can see a cloud, which is the island of Cuba)!. …mas Key West é uma ilha cujas dimensões têm mais ou menos 6,5 Km de comprimento por 1,5 de largura, onde a Duval Street é a típica “main street”, ou seja a rua principal, com quase 2 quilómetros, atravessando 14 pequenas ruas que vêm do Golfo, onde a água é calma e quente, até ao oceano Atlântico, onde a água se caracteriza pela sua cor azul, com muitas zonas onde existe vegetação submarina, com algas a saírem à superfície, desprendendo-se do fundo do oceano, vindo dar à praia. Nestas 14 pequenas ruas, assim como na avenida principal, existe todo o tipo de atracções, desde as casas de personagens famosos que por aqui viveram em determinado momento da sua vida, como os antigos presidentes dos USA, Harry Truman, Franklin D. Rosevelt, Dwight D. Eisenhover ou John F. Kennedy. Um lugar bastante visitado é o que foi a residência de Ernest Hemingway, onde viveu e escreveu o famoso livro “Farewell to Arms”, onde contam as mais mirabolantes histórias deste famoso escritor que adorava visitar o bar da esquina, que ainda se chama ”Sloppy Joe’s Bar”, onde ainda se serve uma bebida composta de rum e coca-cola, ou seja a união do continente USA com as Caraíbas! O pôr-do-sol é muito apreciado nesta área, proporcionando excelentes fotos, onde as palmeiras e outras ramagens tropicais servem de fundo, em contraste com com a cor avermelhada do horizonte, principalmente para o lado da ilha de Cuba. Também por aqui existe um razoável porto de mar, onde o primeiro navio de cruzeiro, que se chamava “Sunward”, aqui atracou no ano 1969 e onde hoje fazem regular visita as companhias de cruzeiros: Royal Caribbean, Magesty of the Seas ou a Carnival Fascination!. (but Key West is an island whose dimensions are roughly 6.5 km long by 1.5 wide, where Duval Street is the typical “main street”, the main street, with almost 2 kilometers, crossing 14 small streets that come from the Gulf, where the water is calm and warm, to the Atlantic ocean, where water is characterized by its blue color, with many areas where there is underwater vegetation with algae to leave the surface, breaking away from the bottom ocean, coming to the beach. These 14 small streets, as well as the main avenue, there are all kinds of attractions, from the houses of famous characters who lived here at some point in your life, such as former presidents of the USA, Harry Truman, Franklin D. Rosevelt, Dwight D. Eisenhover or John F. Kennedy. A much visited place is what was home to Ernest Hemingway, where he lived and wrote the famous book “Farewell to Arms”, which have the most marvelous tales of this famous writer who loved to visit the bar on the corner, which is still called “Sloppy Joe’s Bar, “which still serves a drink made of rum and cola, that is the union of the mainland USA to the Caribbean! The setting of the sun is much appreciated in this area, providing excellent pictures, where palm trees and other tropical foliage serve as background, in contrast with the reddish color of the horizon, especially to the side of the island of Cuba. Also here there is a reasonable sea port, where the first cruise ship, named “Sunward” here docked in 1969 and which today make regular visits the cruise lines: Royal Caribbean, Magesty of the Seas or Carnival Fascination)!. …o local mais visitado, e onde se tiram mais fotos, onde em alguns dias a fila se prolonga por algum tempo, principalmente quando chegam barcos de cruzeiro, é o marco histórico assinalando as 90 milhas de Cuba, erguido em 1983, pintado com cores distintas e com os dizeres já famosos, que são: “Southernmost Point Continental USA”, ou seja, ponto mais ao sul do território do Estados Unidos. Outras atrações podem-se considerar única e simplesmente admirar as casas, os seus telhados, no histórico distrito, onde as estruturas de casas de madeira, com um ou um e meio andares, com datas de 1886, se distinguem por serem construídas sobre estacas de tronco de árvores, sobre a água, com varandas e passeios em frente das casas, que nos fazem lembrar um quadro pintado!. 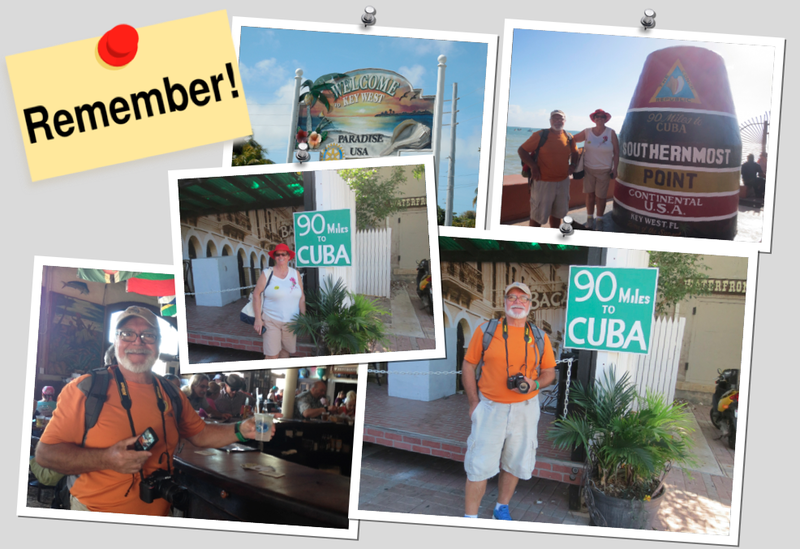 (the most visited place that you take more photos if, where in a few days the queue goes on for some time, especially when arriving cruise ships, is the milestone marking the 90 miles from Cuba, built in 1983, painted with different colors and the already famous sayings, which are “Southernmost point Continental USA”, that is, the southernmost point of the territory of the United States. Other attractions can be considered purely and simply admire the houses, their roofs in the historic district, where the wooden houses structures with one or one and a half floors, with dates from 1886, are distinguished for being built on piles trunk trees, over water, with balconies and walks in front of the houses, which remind us of a painting)!. …embora indo um pouco longe na dimensão do texto, não queremos terminar o mesmo sem vos dizer que esta ilha em tempos pré-colombianos, era habitada pelo povo “Calusa”, que foi um povo que entrou no que é hoje a Florida há alguns milhares de anos, onde o clima tinha alcançado as condições actuais e o mar tinha subido para perto do que é hoje o seu nível actual e as pessoas começaram a viver em aldeias perto de zonas húmidas, locais favorecidos, que provavelmente foram ocupados por várias gerações, onde as pessoas apreciavam viver, ocupando ambas as zonas húmidas, mas com água doce e salgada, onde por séculos, a sua dieta ficou dependente, principalmente de peixe, marisco ou aves, vivendo em grandes aldeias, com montes de terraplanagem, construídos de propósito, às vezes formando pequenas ilhas, onde além de outras ocupações, começaram a criar a cerâmica queimada no fogo, onde se foi desenvolvendo uma cultura regional muito distinta!. (although going a bit far in the size of the text, do not want to finish without even tell you that this island in pre-Columbian times, was inhabited by the people “Calusa” which was a people who entered what is now Florida a few thousand years where the weather had reached the current conditions and the sea had risen to close to what is now your current level and people started living in villages near wetlands favored sites, which were probably occupied by several generations, where people enjoyed live, occupying both wetlands, but with fresh and salt water, where for centuries, their diet was dependent mainly fish, seafood or poultry, living in large villages, with earthwork mounds, built on purpose sometimes forming small islands, where in addition to other occupations, began to create the ceramic burned in the fire, which has developed a very distinct regional culture)!. …tudo isto até que por aqui chegou a primeiro europeu, que foi Juan Ponce de Leon, por volta do ano de 1521, tornando-se imediatamente num território espanhol, como uma aldeia de pescadores e de salvamento, com uma pequena guarnição para sua defesa. “Cayo Hueso” foi o seu nome original em espanhol e as pessoas de língua espanhola ainda hoje usam este termo para se referir à ilha de Key West. Este nome significa literalmente “ilhota óssea”, mas na verdade é uma ilha baixa, com alguns recifes, dizendo-se hoje que a ilha estava coberta com os restos de ossos de habitantes nativos anteriores, que usavam a ilha como um cemitério comunal. Um pormenor importante é que esta ilha, naquele tempo, foi por muitos anos a Key (em inglês chave), portanto a chave ocidental, como um suprimento confiável de água. (all this until here arrived the first European who was Juan Ponce de Leon, around the year 1521, immediately becoming a Spanish territory as a fishing village and rescue, with a small garrison for its defense. “Cayo Hueso” was the original name in Spanish and Spanish – speaking people today use this term to refer to the island of Key West. This name literally means “bone islet”, but in fact is a low island with a few reefs are saying today that the island was covered with the remains of bones of earlier native inhabitants, who used the island as a communal cemetery. An important detail is that this island at the time, was for many years the Key (English key), so the western key, as a reliable water supply)!. …em 1763, quando a Grã-Bretanha assumiu o controle da Florida, a comunidade de espanhóis e nativos americanos que aqui viviam, foram transferidos para a aldeia ou porto de Havana, na ilha de Cuba, mas a Flórida retornou ao controle Espanhol 20 anos mais tarde, no entanto já não houve reassentamento oficial da ilha, pois informalmente esta foi usada pelos pescadores de Cuba, Britânicos e mais tarde os USA, após a sua independência, o que quer dizer que enquanto reivindicada a sua soberania pela Espanha, nenhuma outra nação exerceu o controlo sobre esta comunidade, por algum tempo!. (in 1763, when Britain took control of Florida, the community of Spanish and Native Americans who lived here were transferred to the village or the port of Havana, on the island of Cuba, but Florida returned to Spanish control 20 years more later, however since there was no official resettlement of the island as informally this was used by fishermen from Cuba, British and later the USA, after its independence, which means that while claimed its sovereignty by Spain, no other nation exercised control over this community for some time)!. …voltando ao tempo de hoje, também existe a parte moderna, já com centros comerciais, restaurantes e hotéis “temáticos”, onde nós, na nossa infinita ignorância, perguntámos o preço de uma dormida e, talvez por ser à última hora, sem marcação prévia, nos disseram que estavam superlotados, mas por sermos seniores e talvez “boas pessoas”, nos arranjariam um confortável quarto, pagando somente à volta quatro centenas de dólares por uma noite!. (returning to today’s time, there is also the modern part, as with shopping centers, restaurants and “themed” hotel, where we, in our infinite ignorance, we asked the price of an overnight stay and perhaps to be the last minute without prior appointment, they told us they were overcrowded, but because we are seniors and maybe “good people” in would arrange a comfortable room, paying only around four hundred bucks a night)!.